Administrators | Home of the Bulldogs! As principal of King’s Fork High School, it is my pleasure to welcome everyone back for another great year at King’s Fork. We are all excited to have students back in our building and hallways filling them with energy and enthusiasm for learning. It is our mission to help every child feel welcomed, connected, and a part of our King’s Fork family. Additionally, we strive to challenge each student to grow in his or her academic abilities and to be college or workplace ready by the end of four years. At King’s Fork, we have great teachers who spend hours planning and creating classroom activities to engage our students in learning. Our teachers utilize research-based best practices and analyze academic data to determine current skill levels and to set goals for growth and improvement. We believe that all students should graduate from high school prepared for the demands for postsecondary education, meaningful careers and effective citizenship. We hope that you will find our “Bulldog App” helpful and informative. This free App can be found in Google Play for android phones and the Apple Store for Iphones. All of the information we sent out on the “Bulldog App” can also be found on our website. We also have entered dates for all events and activities into our “Calendar” feature on our website. 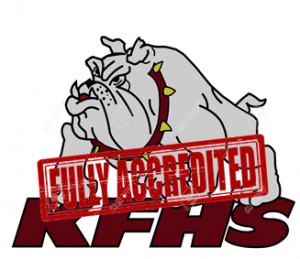 I am honored to serve as the Principal of King’s Fork High School. It is truly a privilege to be a part of a community where parents, teachers and students care for each other and strive to build positive relationships and support academic and social growth. Please feel free to contact me at 757-923-5242 or at ronaldleigh@spsk12.net. Once again, welcome back! Let’s make it another great year at King’s Fork together!